A custom shipping quote is required for the following items due to their large size. Note: Prices shown DO NOT include shipping costs. A shipping quote is required. These products must ship via motor freight (truck) and therefore require a shipping quote. 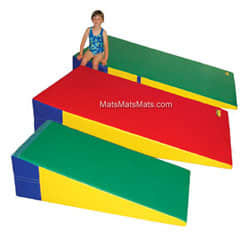 We have many styles and sizes of these popular polyfoam-filled gymnastic incline mats (also commonly called cheese mats for gymnastics). With so many choices, you're sure to find the gymnastic wedge mat you want. Available non-folding or as a folding incline mat. When folded, they do double duty as super spotting blocks. 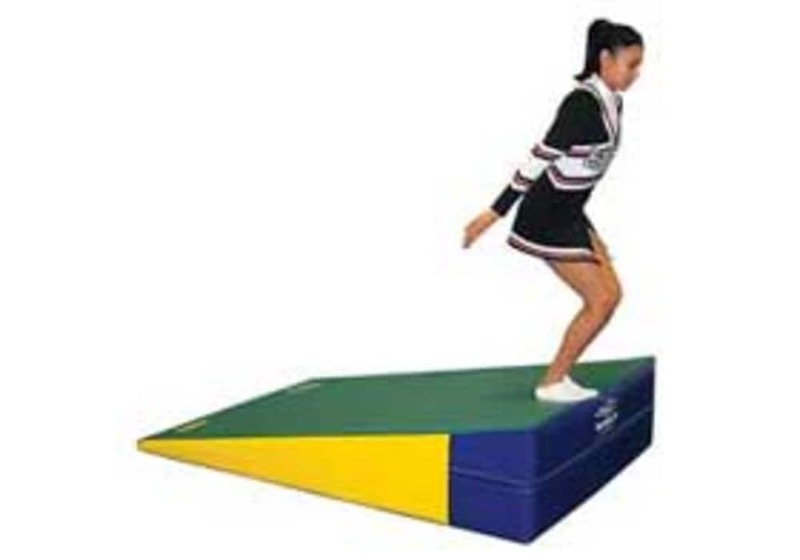 All of our gymnastics wedge mats feature the same top-quality materials: extremely tough 18 oz. vinyl-coated polyester fabric, durable dacron thread, sturdy nylon zippers and prime foam fillers. Heavy-duty 2" wide webbing handles are attached to all inclines for your convenience. 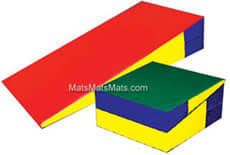 See smaller made-to-order incline mats. See limited styles that are currently in-stock and ready to ship. Covered with tough 18oz vinyl. Filled with prime 70 ILD polyurethane foam. This product is made-to-order. Please call for current delivery timeframe. Topped with a 1-3/8" layer of crosslink foam. Provides firmer footing and better "punchback" for handsprings, etc. Gymnastics Incline Wedge - 30"x72"x12"
Gymnastics Incline Wedge - 30"x66"x16"